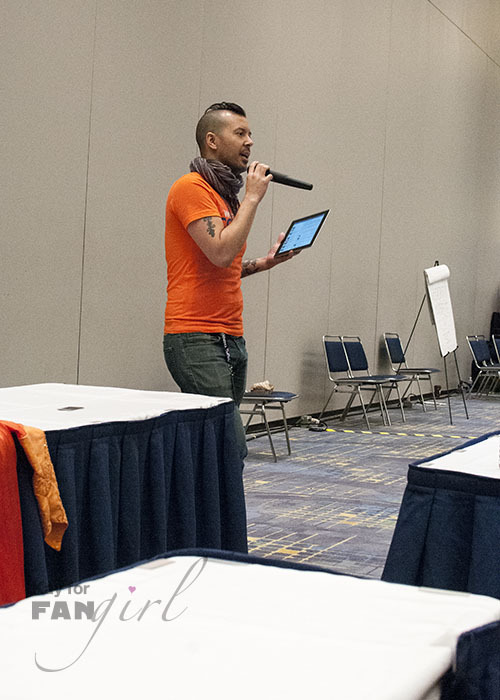 Bigger and better was the theme at C2E2’s new Fan Village location this year. Last year it featured some nice amenities but the room itself was tucked up and away in an area people new to the convention center probably had a hard time finding. For 2016, the village moved down to the first floor right by the entrance to that wing of the building. It’s new location meant more space, more bean bags, more room to change and fix your costumes, and a great place for some more intimate panels. 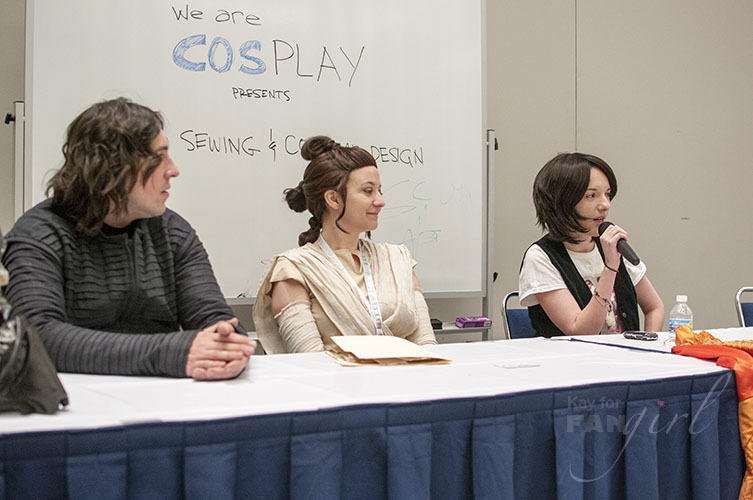 A cosplay charity group called We Are Cosplay ran several of the panels including Sewing and Costume Design. 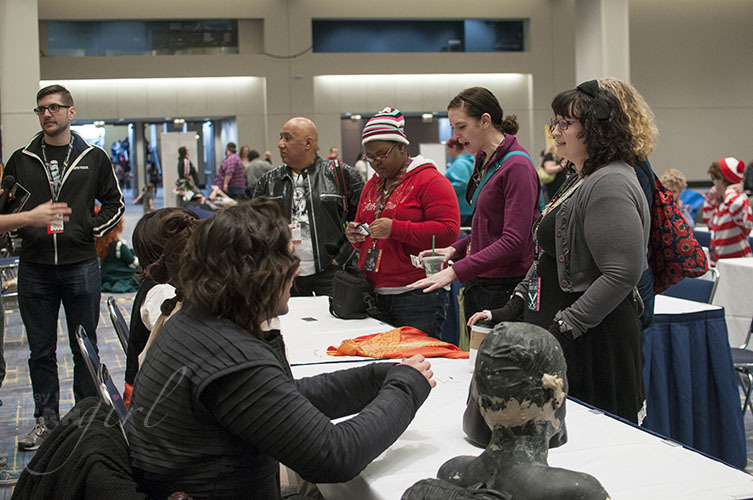 This panel was helmed by long-time costume-makers Lisa Hale, Toby Markham, and Courtney Jacobson. After introducing themselves and sharing a bit about their background, they told the stories of how they got started sewing and making costumes. Toby knew nothing about sewing when he began making costumes. He hadn’t taken any classes. Instead he started by taking apart his own clothing to understand how different pieces get put together. He mentioned this is also a good way to start having a guide to make pieces that actually fit you well. Courtney added that after you understand how pieces are assembled the next step is working with commercially-available patterns and modifying them as you learn how to make more dramatic changes. Lisa, who went to school for fashion design, said after you’ve mastered that you can look at draping, but, as Courtney noted, there is a wider margin of error when you’re draping. 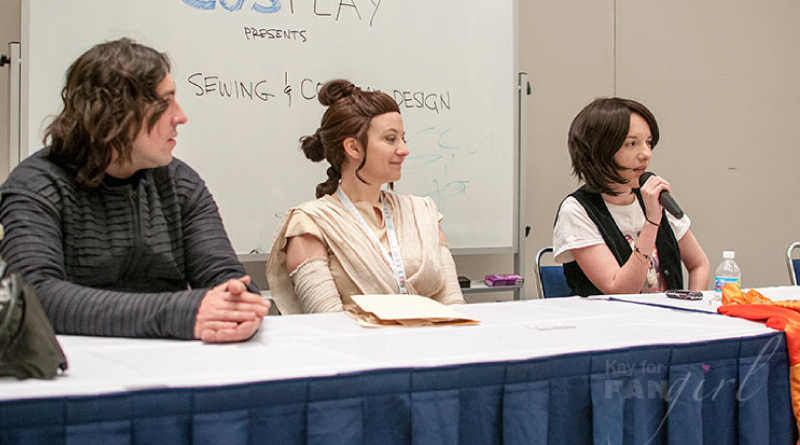 The panelists overall had mixed feelings about using draping for their costume construction. At a later point the panelists talked about how when designing and constructing a costume you get to decide if you want them to be accurate replica-type costumes or costumes that get the general look of something else or are entirely brand new concepts. They’re all valid paths. 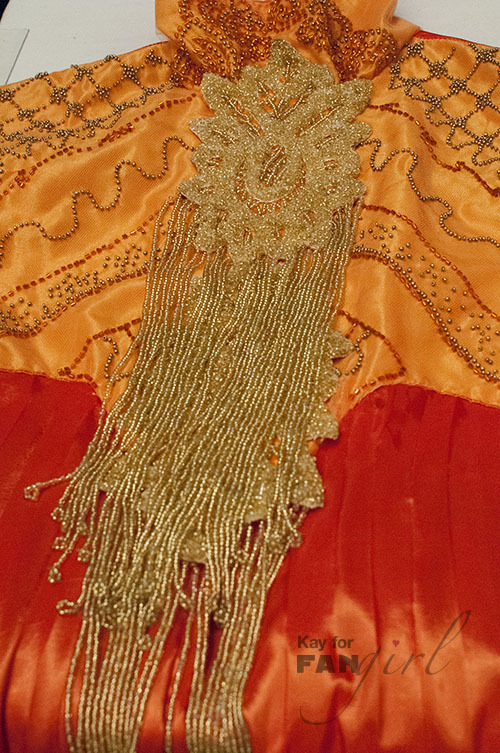 With replica costumes there’s the added challenge of finding the right fabrics and that information is not always readily available. With brand new designs there’s the challenge of figuring out how it’ll all work – something Courtney says she’s faced with her work making costume designs out of inanimate objects, like Games of Thrones’ Iron Throne. 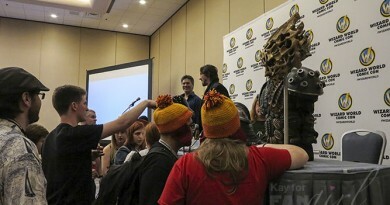 Most of the rest of the panel was a Q&A that gave a chance for con-goers to get tips and guidance on the areas they’re most curious about. We’re sharing them here so those who couldn’t attend can hopefully pick up some tips too! Answers are not direct quotes unless noted as such. Audience Question: What was your biggest costume making fail? Toby – Cutting own skin instead of fabric or with fabric. Sewing while tired. Courtney – Agreed sewing when tired usually leads to the most mistakes even though if she’s on a deadline she’s usually willing to stay up all night to get something done. She once did not plan ahead of lining a piece when she was modifying a pattern for a costume and ended up having to start all over again. Courtney also highly recommends not holding pins in your mouth and getting a pincushion you can strap to your wrist instead. Lisa – Agreed sewing while tired is often problematic. Q: Is there anything you recommend buying instead of making if you’re a beginner? A: Focus on making the pieces you’re comfortable making first. It’s ok to buy/commission someone to make helmets or props if you’re not ready to take those on. There’s also the option of forgoing props or costume parts all together. You don’t necessarily need every piece when you’re starting out. Q: How do you make replicas of your body parts to build off of? A: If you’re life casting, only do it with someone who knows what they’re doing. You don’t want someone trying something out for the first time on your head and the materials aren’t cheap. You can’t do it alone. Cheaper option: duct tape dummy. There are tutorials on YouTube and other sites to show you how to make a duct tape dummy. You’ll still need someone you trust to help you out, but basically you put saran wrap or bags around your arm or leg or torso and then have someone wind duct tape around you. They’ll have to carefully cut you out once it’s done. But then you can stuff it if needed and form or sew items that are exactly your size and shape. Q: Where do you get fabrics? A: Try your local fabric stores first. It’s always nice to be able to see and feel a fabric before you buy it. You might not find what you’re looking for though because some stores are mostly catering to quilters and crafters so also try online. Order swatches. Swatches typically are relatively inexpensive. Courtney keeps binders of swatches so she can reference them when she’s looking for fabric later. Q: When do you wash fabrics ? Before or after construction? A: This is dependent on what fabric you’re using. And as Toby pointed out, if you’re weathering your fabrics and dirtying them up, washing them after is often not an option. Wools and other special fabric should be dry cleaned. Cottons can be washed before. 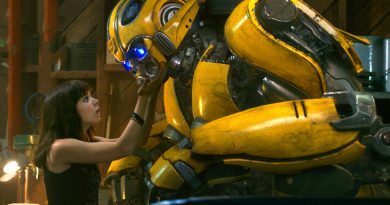 Q: Do you have any time management tips for costume construction? A: Add 20% more time than you think you need. Break the tasks into parts and make goals for what you’ll do each day. Or you can go with the sleep when you’re dead approach. If you find yourself running behind, hot glue can be your friend, but come back and do your seams for real later or it’ll eventually fall apart. What other things would you like to learn about sewing and costume design?